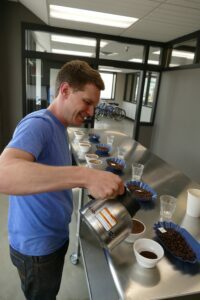 The art and business of making coffee appeals to Kyle Hendrickson’s entrepreneur’s mindset and his knack for figuring out efficient process improvements and tinkering with equipment. But at the end of the day it’s building community that is Hendrickson’s driving passion. 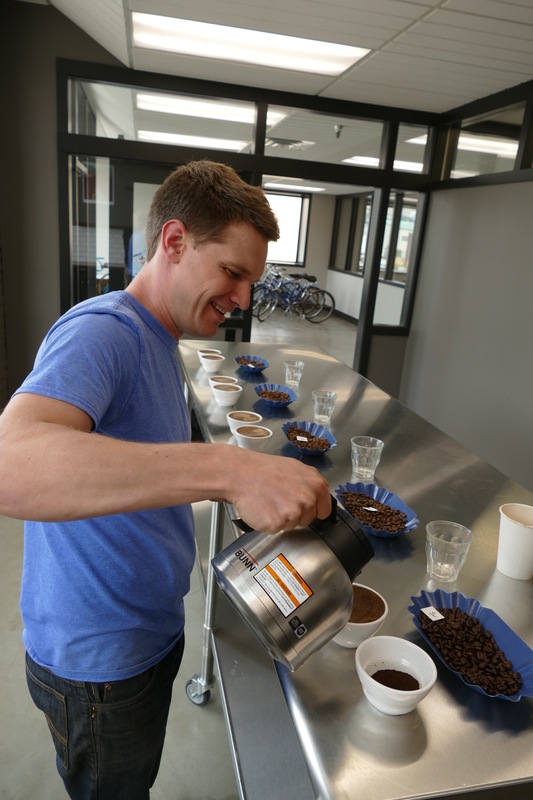 A little over two years ago, he bought Caffe Mela in downtown Wenatchee and has recently expanded its shipping and roasting operation. When he was 13, Hendrickson recalls wanting to making a spear-gun to use while snorkeling, although that experiment left him with a gouge in his leg. Trying things to see what works and what doesn’t is part of his personality. Sometimes it works, sometimes it doesn’t. Hendrickson, who is married to Wenatchee native Ann Foreman, studied Greek and Latin at the University of Washington and ended up working in research and development and product management for a water sports companyAfter graduate school, he went to work for Foreman orchards and served as chief financial officer before striking out on his own in the coffee roasting and retail business. There’s something about the atmosphere of the coffee house that inspires Hendrickson. While understanding the business side took a lot of time, he immediately understood the value of the café in terms building a sustaining community. “What I love most about coffee,” said Hendrickson, “that connections create connections.” There’s local art on the wall and the place is filled with students, kids, moms, artists and business people and sitting outside might be a guy making hemp jewelry. “There are deep conversations about life over coffee,” he said. He hopes to enhance that sense of community even more. Mela has purchased some used bicycles in the valley, painted them a distinctive blue color and those will be used by Mela employees going back and forth between the café and the roasting operation. 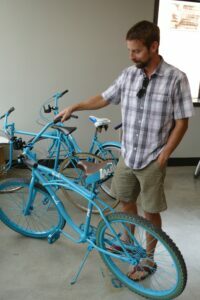 But his ultimate dream is to figure out a way to make those available for customers and community members to explore downtown on their own. He only needs to figure out the liability issue, but he’s working on that. Building community also is reflected in his involvement with Lighthouse Ministries, which provides a growing list of services and Christian ministry to homeless individuals in the valley. The nonprofit is primarily supported by local individuals, Hendrickson pointed out. He said he has worked hard to develop a work-life balance that keeps him on an even keel. One strategy that has worked well for him is to try to maintain sole focus on the project at hand rather than trying to multitask and do several things at once. His other secret is developing strong teams and creating an atmosphere where people can use their talents.